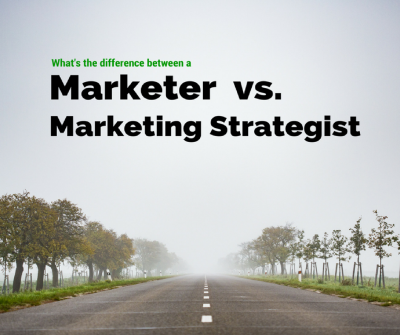 What’s the difference between a marketer and a marketing strategist? Sometimes the future looks a little foggy and because we don’t know what lies ahead we focus simply on what we can see. This reactive approach to business is what happens with the majority of business owners, and unfortunately this how most marketing professionals operate as well. What most marketers mean when they refer to “strategy” is how they will match your brochure to your website or that they’ll focus on several of your social media platforms to make sure they all say the same thing. Those are still tactical marketing initiatives and although it’s nice of them to help you create some cohesive branding, that is not the definition of strategy. According to Wikipedia,”A strategist is a person with responsibility for the formulation and implementation of a strategy. Strategy generally involves setting goals, determining actions to achieve the goals, and mobilizing resources to execute the actions. A strategy describes how the ends (goals) will be achieved by the means (resources). It involves activities such as strategic planning and strategic thinking.” A marketing strategist will help you look at your entire business model and will take into consideration things like your operational needs, financials and employee challenges. Furthermore, a marketing strategist is someone who knows the right questions to ask about your business in order to derive a game plan to get you your specific results. Marketing strategists will also keep you focused on long-term objectives while addressing immediate needs as well. A Marketer who projects their own objectives on you or tries to sell you one given product or service, is not a strategist. The most notable difference between a marketer and a marketing strategist is that a marketing strategist is able to develop a strategic marketing plan or action plan for you. This is something outside the scope of a typical marketing professional. When it comes time to develop a marketing plan or strategic action plan of any kind, make sure you are working with a seasoned marketing strategist.